Like death and taxes just a few days after we got home from our trip to Trinidad, Sean started coming down with a cold. Poor thing. Summer colds are just the worst, and my boyfriend is someone who gets sick maybe once a year on average. While there wasn’t much I could do for him besides push ibuprofen and liquids while waiting for the cold to run its course, I did also whip up a batch of my mom’s chicken soup. I have no idea where my mom got this recipe for chicken soup, but it’s a hearty one to be sure, full of good veggies and orzo pasta (a nice change from the traditional noodles found in most chicken soups) and chicken. Normally, I would make it more during the cooler months, but whenever someone gets a cold, regardless of the time of year, this soup will do the trick. Trust me. The recipe is quick to make, low-fat and it can be made with cooked or uncooked chicken, depending on what you have on hand. The same thing goes for the veggies – use what you’ve got in the kitchen or what sounds most appealing. 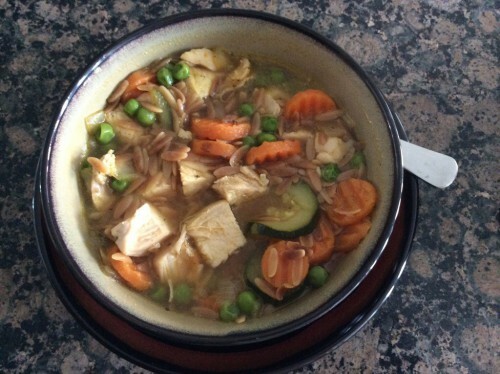 Anyway, here’s the recipe for chicken soup, guaranteed to improve even the worst cold sufferer. Using the same pot, add onions, carrots and celery and saute until tender – about 3 minutes. Add the zucchini and saute another 2 minutes. Add the toasted orzo and peas back to the soup pot and cook 5 more minutes. Remove the chicken and shred the meat with two forks, then return to the pot. Finally, add parsley, salt and pepper to taste. Serve into soup bowls and you’re ready for a dinner designed to cure what ails you. (Or just warm your bones too). Tell me that heaping bowl doesn’t look like a generous portion. Hot off the stove and ready to eat. 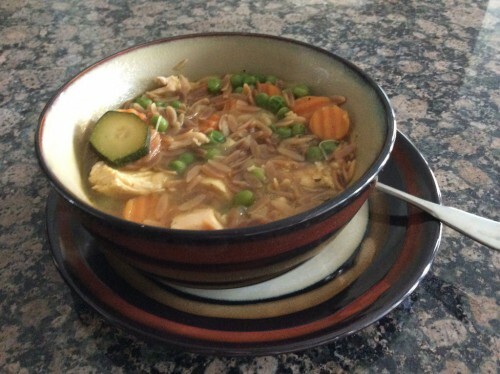 This entry was posted in Entrees, Recipes and tagged Chicken, Chicken Soup, Cold, Entrees, Low-fat, Orzo, Recipes, Sick, Soup on August 13, 2014 by Paige N..